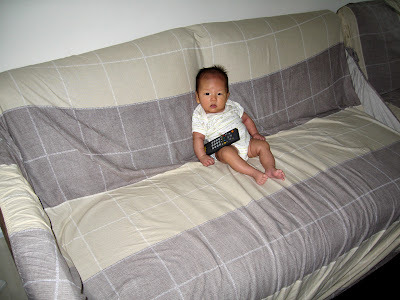 Natalie, Lauren and Ashley's Blog: TV Junkie... caught in the act! Natalie loves to watch TV. She loves to sit on her daddy's lap and watch with us, or when we put on "Baby TV" (special channel designed for babies with music, high-pitched voices, and colourful repetition... not recommended for sane adults). Even when we're watching TV and put her down to lie next to us, she will crane her neck so she can watch too! Look how strong her back and neck are... she can now sit propped up on her own.